How Does a Tooth Start to Decay? Did you know that over 90% of adults in America under the age of 60 have had tooth decay in at least one of their permanent teeth? Cavities are also the most common chronic illness in school-aged children. Treating tooth decay depends on its severity; however, preventing tooth decay is deceptively simple. To help minimize tooth decay’s effects, we explain how a tooth starts to decay and form a cavity, and how you can protect your smile from it. Surrounding the top part of your tooth, or crown, is a layer of tooth enamel—the strongest substance that your body produces. Enamel is also highly mineralized, and while strong, it is subject to erosion. If it erodes enough to form a hole, enamel cannot regenerate itself. However, when weakened, enamel can strengthen itself by absorbing additional minerals (i.e., calcium and phosphate) before it becomes compromised. A common belief about tooth decay is that it only occurs when you eat too much sugar. While not entirely incorrect, sugar is not the main tooth decay culprit, and cavities can occur even without the aid of sugar. The true reason your tooth decays is acid, which oral bacteria make by consuming sugar and carbs. Some foods and beverages, however, naturally contain acid, and can facilitate tooth decay without the aid of bacteria or sugar. However it enters your mouth, acid attacks and weakens your tooth enamel while sapping enamel-friendly minerals from your teeth. This process, called demineralization, is the beginning stage of tooth decay. Once your enamel is weak enough, bacteria can slip past it and infect the main body of your tooth, called dentin. 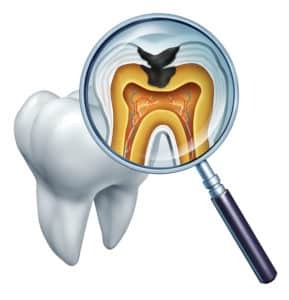 A cavity, or hole, will form in the dentin as decay spreads, and restoring the tooth will require a filling (or root canal treatment, in more severe cases).